A wonderful day and a treat to be able to go up in one of these balloons. One gets the feeling of height from the POV! Oh lucky you. That must have been so much fun. Fantastic .. you will be still buzzing..
What a wonderful day and this flight to top it! Great capture! Fav! It sounds like an action-packed day and yet you still found time to post pictures! This is a fabulous perspective! Each day I am eager to see what you have experienced! I love your POV here. Is that Bob in the photo? Sounds like you are doing what you should be doing on vacation. Enjoying it! Wow there are so many of them! It must have been a perfect morning for ballooning. Fantastic POV! My husband and I were saying that next year we have to do a balloon ride! Can't wait. Glad yoi were able to do that! Wow what a thrill! My wife wants to go on a balloon ride, but its hard to find someone who has a balloon that is will to take you on a ride. Insurance I suppose! A fantastic vacation! This looked like an amazing experience. I really have wanted to do that. I like the tight focus in your shot. @taffy I'm practically leaning out of the basket to get camera to focus on the pilots back. 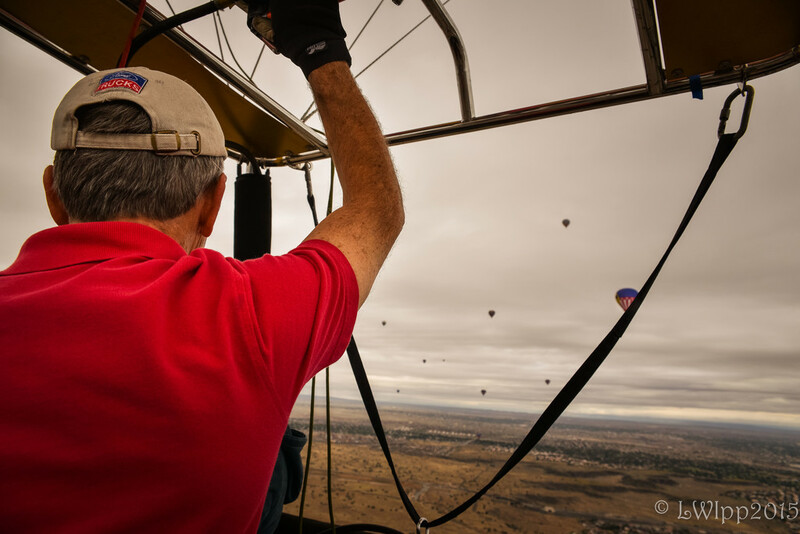 I think the shot would have been better if I could have gotten a little of the basket and his whole hand but who takes a wide angle lens on a balloon ride? You are braver than I am. I hate heights. You're so brave! I don't mind heights too much but going this high might make me dizzy. Cool view! Beautiful.....so glad you went up!! I hope this was your first balloon ride.....what a thrill this must have been!! We have signed up for one on our African safari this November, and I am so looking forward to it....I think I might bring every single lens and camera I have on it!! @cjphoto you'd be fine. It was a piece of cake. You're so busy looking and photographing you don't think of the height.